The Connecting Council has authorized the Great Plains Conference Trustees to study and recommend the location for a single conference office during the upcoming annual conference session in June. The decision came from a vote as part of the council’s regular spring meeting April 21-22 at St. Luke’s United Methodist Church in Lincoln. The Connecting Council – a group of 75 clergy and laity from all 17 districts that serves as the Great Plains’ decision-making body between annual conference sessions – voted unanimously to support the concept of a single conference office as part of its review of recommendations from a staff study conducted by the Rev. John Wimberly, a retired Presbyterian pastor, respected author and consultant with a resume of helping organizations – from local churches to large faith organizations – restructure to best accomplish stated goals and overall vision. The conference currently has three offices. The Congregational Excellence staff is based in Wichita. The Clergy Excellence staff is based in Lincoln. And the Administrative Services staff is based in Topeka. All three offices also have personnel dedicated to accounting and other administrative duties. The Connecting Council examined all of Wimberly’s report by reading sections in their entirety, conducting small-group discussions at tables and then taking part in discussions with the entire group. The council then voted on each recommendation point by point. The bishop said none of the decisions were based solely on budgetary savings, though that would be the result in a few cases. Instead, the consultant was directed to focus on methods and strategies for effectively and efficiently supporting the mission of the conference. Wimberly’s report suggests that the conference staff will be more efficient, improve internal communication and foster greater teamwork if it is all in one location. Wimberly said that during his more than 160 interviews with staff, clergy and laity in late winter across the two states, it became clear to him that a single office would help the staff better deploy resources to local congregations for use in addressing needs in their mission fields. The Trustees will review possible cities in Kansas and Nebraska based on property prices, construction and renovation costs, an adequate job pool for lay-related roles, access to highways, access to an airport with a favorable departure schedule, and an adequate job market for spouses of conference staff. The annual conference session in June will vote on two matters associated with the report: first, whether to condense the three offices to one and, second, whether to approve the location recommended by the Trustees. The other recommendations in Wimberly’s report focused on staffing size, location and functions of various roles within the conference. Hire an executive director. This position will, in effect, fulfill duties of assistant to the bishop and directly supervise the directors of congregational excellence, clergy excellence, administrative services and communications. This shift will allow for day-to-day operations to be run with fewer silos and with improved communication and collaboration. The addition of this position will give the conference, in effect, a chief operating officer and also will free the bishop to focus more on the spiritual guidance, vision and leadership of the conference. Create a team to overhaul the way the Great Plains Conference manages data. This group will focus on how information is processed to avoid duplication of efforts among the many administrative forms required within the denomination. Assemble a team to assess which districts need physical offices and analyze best practices for how administrative assistant work is done in the 21st century. Move the Safe Gatherings function from the Congregational Excellence team to the Administrative Services team. Cease publication of the quarterly GPconnect magazine in favor of more 21st-century friendly modes of communication after the July 2017 edition. Besides the addition of the executive director position, the consultant recommended several changes in personnel within the conference. The council approved the increase of the lay leadership development coordinator position, currently held by David Brant, from a part-time to a full-time role and directed the Personnel Committee to rewrite the job description of the property manager, currently served by Patrick McKaig, to focus more directly on real estate sales and acquisition, reflecting the growing need for concentrated attention on the purchase, sale and management of properties. Two areas of the conference’s work were approved for further study. One team will be assembled to evaluate the use of the Resource Center, which serves as a library for Christian education materials, based in the Lincoln office, and make recommendations about its continuation and staffing. Another team will evaluate best practices for conducting the duties of administrative assistants at the district level and will make a recommendation to the annual conference session in 2018 as to which offices should remain open and, potentially, determine how to perform some functions within a smaller team of administrative assistants. The recommendations adopted by the Connecting Council also resulted in the reduction of three staff positions on the Congregational Excellence team, effective July 1. As the new director of that team, the Rev. Nathan Stanton will continue to manage a portfolio of tasks associated with new church development but also will oversee small-membership church ministries and Hispanic ministries, which currently is led by Corey Godbey. Stanton, the current new church development coordinator, moves to his new role when the appointive year begins this summer, and the Rev. Micki McCorkle, coordinator of small-membership church ministries, already had accepted an appointment to serve as pastor of Trinity United Methodist Church in El Dorado, Kansas. The only two recommendations rejected by the council included the creation of a new full-time position on the Clergy Excellence team to address ongoing concerns about the health and well-being of pastors. 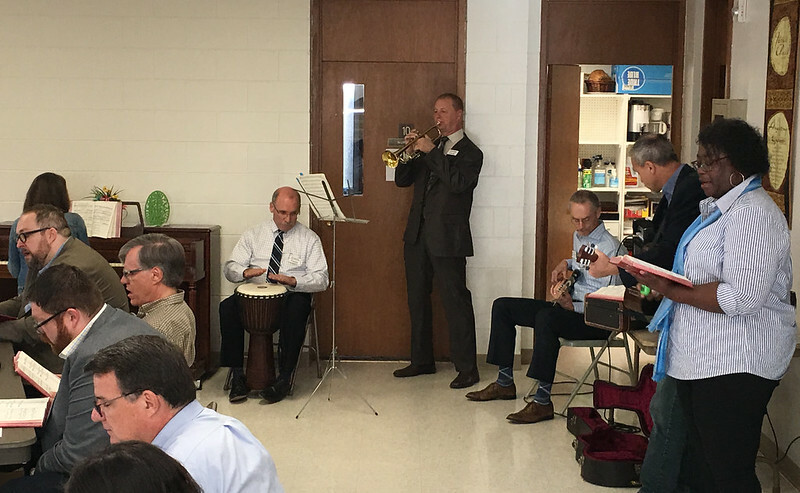 Citing budgetary concerns, the Connecting Council decided instead to add a component of clergy wellness to the position of clergy excellence director. In addition to training and development of clergy, the person in that position, the Rev. Nancy Lambert, also will spend time fostering clergy wellness and building learning, support and training systems to grow their faith and skills. The second item rejected was a recommendation to bridge the gap between conference staff and laity within Kansas and Nebraska by using community-building events such as conference staff visiting districts for training and “mission fair” style road shows so laity better understand what resources are available from the conference. The council decided the conference staff already takes part in such visits but would urge the conference staff to find more ways to take part in those kinds of events. Voted to recommend to the annual conference session an expense budget for 2018 of $15,242,492, which balances with projected income. The budget accounts for a projected decline in income of about $282,000, or 1.8 percent below 2017. Details of the budget proposal will be posted soon on the conference website. Heard a report from Kelly Williams from the Pension and Health Benefits team. The group is examining options of either maintaining the stipend paid to pastors for the purchase of health insurance or considering a private exchange from which to offer a group plan. The team has another meeting soon and will provide details about the options prior to the annual conference session June 7-10 in Grand Island, Nebraska. Watch the weekly GPconnect email newsletter for information as it becomes available. Heard a report from the Rev. Gary Beach, conference treasurer and director of administrative services, on finances through the first quarter of 2017. Receipts after the first quarter closely mirror income from this time in 2016, with about 28.87 percent of total anticipated mission shares paid through the first 25 percent of the year. Reviewed five constitutional amendments passed by the 2016 General Conference. These amendments will be voted on by the 2017 annual conference session. The amendments can be debated but they cannot be amended in any way. Vote tallies will not be reported to avoid influencing votes in other annual conferences but will be turned over to the Council of Bishops, which will announce the results after all votes are tabulated. Approved a request for $24,700 to be pulled from the Missional Opportunity Fund to fund coaching training to help clergy become more effective, fruitful leaders. Created an urban ministry task force to help leverage resources by identifying partnerships between United Methodist congregations and other religious and non-religious partners, as well as work to strengthen already established assets in urban ministry. Voted to support a resolution for the annual conference session to authorize the Connecting Council to develop a “Rules, Policies and Practices” document to serve as the controlling document for those functions within the conference. Heard a presentation from Bishop Saenz about the small-group study “Wonder, Love and Praise: Sharing a Vision of the Church.” The four-session study is meant to educate about the denomination and to solicit feedback on the nature of the United Methodist Church. The study was created by the Committee on Faith and Order in response to Petition 6033 from the 2016 General Conference. The goal is to have at least 10 percent of United Methodists take part in the small-group study. Approved changes to the short-term and long-term disability policies for lay staff members. Passed a proposal to further outline the function, composition and duties of the Mission Alignment Team. Voted to recommend that the Great Plains Conference maintain its current slate of delegates to the called special session of General Conference, scheduled for Feb. 23-26, 2019, in St. Louis. Approved a nepotism policy for boards and teams. Approved a bylaw change for the Kansas Health Foundation. Approved the slate of officers for the Forest Park board.